The Washington Capitals have been struggling to score lately, particularly forwards not named Alex. Entering Wednesday's eventual 5-2 loss to the Ottawa Senators, only six of the Caps' 20 goals this month had been scored among the rest of the forwards. That changed Wednesday during the third period when Mathieu Perreault scored his first goal since February 7, but continuing the awful luck that has plagued the Caps lately, he did not score with his stick. He actually scored off his face. Jason Chimera earned the primary assist on the play, but it really should read "Mathieu Perreault from Mathieu Perreault's tongue and Chimera." 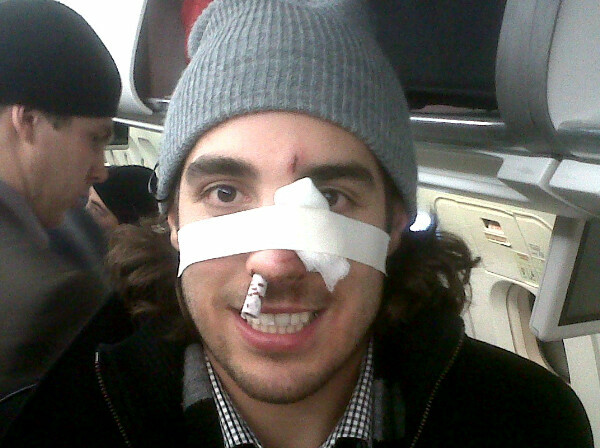 After Thursday's practice, Perreault said that he suffered a chipped and loosened bottom tooth, but admitted that it was worth it to score a goal. Someone get his tongue in traction. Or let him borrow Dmitry Orlov's facemask.